It is finally here! The moment many of us have been waiting for. There has been a lot of drama surrounding the fate of Electric Forest and both sides have said the festival will go on. Although, people were very hesitant especially those who have already purchased tickets. With that said, today Electric Forest showed their love on Valentine’s Day in the best possible way…by releasing their 2014 initial lineup! This is very exciting news as this is one of the best festivals of the year. The concert will take place from June 26th to June 29tht in Rothbury, Michigan! Tickets cost $264.50. This is one festival you don’t want to miss. 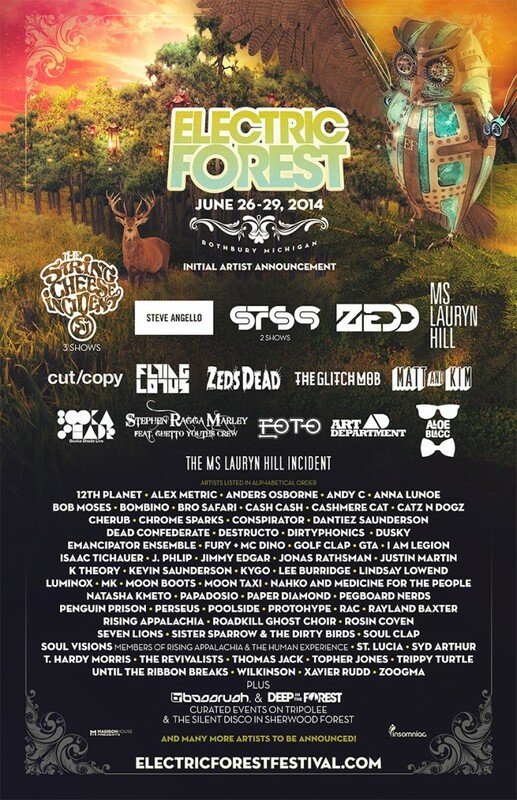 They have some amazing headlines such as Zedd, STS9, Steve Angello, The Glitch Mob, Zeds Dead, and more! Although, you got other artists like Pegboard Nerds, Bro Safari, Cash Cash, GTA and more! This is just their initial lineup. There will easily be more artists that will continue to blow us away. Trust me when I say this, you don’t want to miss this festival. The aesthetics, the music, the experience are all something that is amazing. We’ll keep you updated for more! List of all the artists: 12th Planet, Alex Metric, Anders Osborne, Andy C, Anna Lunoe, Bob Moses, Bombino, Bro Safari, Cash Cash, Cashmere Cat, Catz N Dogz, Cherub, Chrome Sparks, Conspirator, Dantiez Saunderson, Dead Confederate, Destructo, Dirtyphonics, Dusky, Emancipator Ensemble, Fury, MC Dino, Golf Clap, GTA, I Am Legion, Isaac Tichauer, J. Phlip, Jimmy Edgar, Jonas Rathsman, Justin Martin, K Theory, Kevin Saunderson, KYGO, Lee Burridge, Lindsay Lowend, Luminox, MK, Moon Boots, Moon Taxi, Nahko and Medicine for the People, Natasha Kmeto, Papadosio, Paper Diamond, Pegboard Nerds, Penguin Prison, Perseus, Poolside, Protohype, RAC, Rayland Baxter, Rising Appalachia, Roadkill Ghost Choir, Rosin Coven, Seven Lions, Sister Sparrow & The Dirty Birds, Soul Clap, Soul Visions, St. Lucia, SYD Arthur, T. Hardy Morris, The Revivalists, Thomas Jack, Topher Jones, Trippy Turtle, Until the Ribbon Breaks, Wilkinson, Xavier Rudd, and Zoogma. Although internet sites we backlink to beneath are considerably not related to ours, we feel they are basically really worth a go via, so have a look.